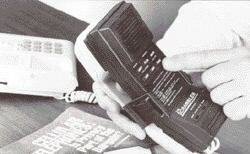 The Portable Telephone Scramblers were portable and could be used on almost any land line phone of cell phone. They were highly popular in the 1970's and scrambled telephone conversations from end to end. You would need two (one on each end on the telephone call). There where many uses. They were used b y countermeasures sweep teams as part of their overall service to clients. Private investigative agenices would give one to one of their high end clients to call them. This not only provided a good communications security method, it also impressed the client. Here is how they operated and their specs. The Scrambler is a strap-on telephone device designed to scramble your conversations from end to end (each party must have a Scrambler set to the identical digital code). From simple monitoring of cellular phone conversations to subversive bugs and taps, the Scrambler protects your communication, and because it is fully self-contained, it can be used anywhere in the world without modification. The Scrambler employees a speech spectrum inversion technique which is digitally controlled by the unit code select switches. There are 13,122 user selectable codes in four factory code groups providing 52,488 code combinations. Operates on a standard 9-volt battery. • The SCRAMBLER employs a speech spectrum inversion technique which is digitally controlled by the unit code select switch concealed in the battery compartment. There are 13,122 user selectable codes in four factory code groups providing 52,488 code combinations. • Coding System operates over long international distances and prevents unauthorized interception by other units. • can be used with conference calls between two or more parties.